We all know the stories about sheep and sheep herders. At least I have. Something about greasing up the mutton chop and pushing it over a fence (wink wink). What I’ve never seen is a circle of sheep. Apparently it does happen. On January 25, one Russell Bird snapped this photo of 100 sheep in a near perfect circle in Hertfordshire, England. The circle lasted ten minutes, ending when a farmer drove a tractor into the field. Perhaps they were following the leader, who in turn followed the end of the line. 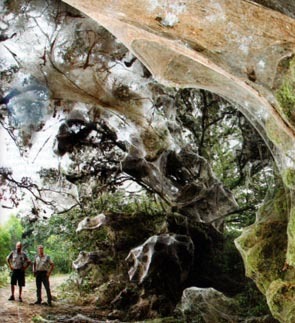 This is a real spider web in Texas. No, William Shatner will not save you from this one. If you haven’t seen Kingdom of the Spiders I urge you to. The movie is awful, but watchable. You have Shatner’s acting (or over acting) and the scene where he changes the fuse is especially good. Also the opening scene showcases the best actor in the film: the cow. There are three reaction shots where the cow “senses” the spiders coming to attack her. Astounding. This entry was posted on March 23, 2008 at 5:45 am and is filed under Rotten with tags sheep, spider, web. You can follow any responses to this entry through the RSS 2.0 feed. You can leave a response, or trackback from your own site.